So the Seattle snow-pocalypse seems to be over, but the rain is rather heavy by local standards. Coming from Florida, the NW winter rains never seem that heavy, just incessant. Living in a small apartment, I have to be careful how much water I bring inside with me. If I had a garage, I could just leave all the wet there. But since everything has to fit inside, I developed a system. 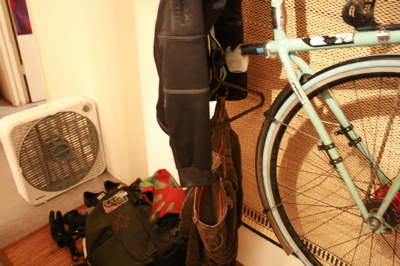 Wet bike goes on the wall hanger, all wet clothes hang on the bike. Shoes, socks, bag, and gloves go on the bamboo mat below. Then I put the floor fan on high to dry it all out. Everything is usually dry in about 8-12hrs, and the cool air is better for the technical apparel than a clothes dryer (which I don’t have anyways).